Reflecting on his native Sicily in a 2001 interview, late-starter novelist Andrea Camilleri, who was 69 when he began writing his bestselling Inspector Montalbano novels and short stories in 1994, talked of the fascinating diversity of an island race that other Italians too often dismiss, he says, as “anti-social bumpkins”. Sicilians, he pointed out, “carry the blood of 13 different occupying powers. The result is that we have the intelligence of true bastards, their vivacity, richness and cunning”. This richness informs every page of Camilleri’s books: it’s there not only in the restless, smart, inconstant, gourmandising character of his main character – a cultured cop whose ingrained scepticism proves invaluable in his line of work – but is refracted and reflected in the gallery of friends, family members, work associates, mafiosi, witnesses and victims that he encounters along the way. Camilleri is equally at home with the television series’s eastward shift of his novels’ locations, calling the settings of the screen Montalbano “extraordinary”. And indeed, the Sicilian tourist board could wish for no better promotional campaign than Inspector Montalbano, which has been something of a hit on BBC Four (and which returns in the autumn). But now there is the added hook of six episodes of Young Montalbano (which began last night on BBC Four), the prequel to the Inspector Montalbano series. The new series stars versatile young Italian actor Michele Riondino as a fledgling inspector who is still finding his feet, in work as in love. The 88-year-old writer makes no secret of the fact that the fictional “Vigata” where Montalbano is based is his home town of Porto Empedocle, near Agrigento. So proud is the town of the connection that in 2003, it officially changed its name to Porto Empedocle Vigata. However, although it has a few handsome corners in the old town and one impressive natural feature, the Scala dei Turchi, a seaside marl formation scraped clean by wave and wind that seems a vast work of land art, Porto Empedocle is essentially a working town, dominated by its ferry port (hopping off point for the islands of Linosa and Lampedusa) and cement works. It was hardly surprising that the producers should change location. Set in the early Nineties, Young Montalbano’s story begins in the remote mountains of central Sicily, where the lad from the coast feels like a fish out of water. It’s not long, though, before a string-pulling girlfriend helps to secure him the Vigata job, bringing Montalbano back to his hometown, to the seafood dishes he’s been dreaming of, and to a long-running conflict with his wine-producing father. In other words, from halfway through the first episode of the prequel season, we’re immersed in the warm southern Sicilian locations that will already be familiar to viewers of the two Inspector Montalbano series. Following in the best TV tradition, the Vigata we see on screen is a composite rather than a single place. Mostly, its exteriors and interiors were shot on location in Ragusa and Scicli – two of the brace of honey-coloured sandstone towns that were reconstructed by the island’s Spanish overlords after a 1693 earthquake – and on the coast immediately to the south, between Scoglitti and Pozzallo. Keen-eyed viewers will notice that this impressionistic approach extends at times, to swapping locations for the same fictional setting – for example, the police station that the young Montalbano visits in the first episode with Mary, his pre-Livia girlfriend is, at least externally, not the one that fans of the two Inspector Montalbano series will be familiar with. The first is in Comiso, another handsome Baroque-era town on the edge of a barren plateau; the second is the town hall of Scicli. But this breadth of coverage is inevitable in an area where you just have to turn a corner to stumble on to yet another unmissable photo opportunity. What follows, then, is not a slavishly accurate “Montalbano tour” but a series of suggestions for those keen to absorb the colours and flavours of a part of Sicily with a special quality of light, landscapes possessed of a stark, archaic beauty, and historic town centres the equal of anything you can find in Tuscany. Plus – an important detail given Montalbano’s passion and knowledge about it – some of southern Italy’s most delicious food. Nothing quite prepares you for the first view of Ragusa Ibla as you round a bend on the road from Modica (whose impressive Ponte Guerreri viaduct features in the opening credits of the main series). 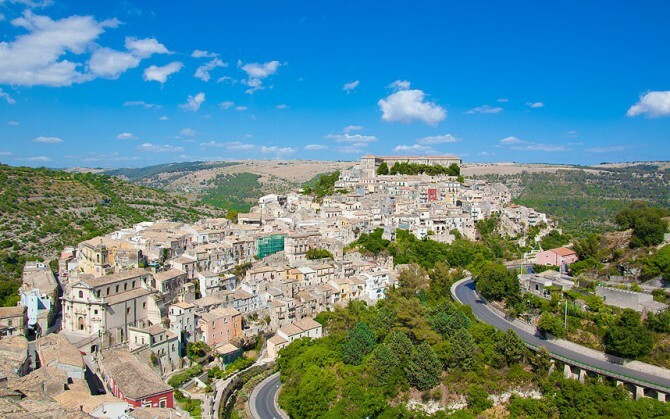 There are plenty of handsome old towns in Sicily, but Ibla – the ancient part of a city that was spilt in two by the 1693 earthquake – looks as if a team of masons had carved the place out of a whole hill, like the world’s biggest sandcastle. It’s no less ravishing on the inside. If you approach from Ragusa Nuova – the rationally planned early 18th-century new town – first stop has to be the terrace in front of the church of Santa Maria delle Scala, vantage point of so many Montalbano placing shots, with a view taking in the whole bristling ridge of the old town below. Take the stairs below – another Montalbano haunt – and before long you’ll find yourself in Piazza Duomo, dominated by the cathedral of San Giorgio atop its broad stairway. In the piazza, don’t miss the little neoclassical Circolo di Conversazione, founded as a social club for the Ragusan gentry, where Montalbano breaks in on coroner Dottor Pasquano’s card game in the main-series episode The Scent of the Night. The inspector’s favourite restaurant, the Osteria of Don Calogero, is in reality La Rusticana (Corso XXV Aprile; 0039 0932 227 981; average £29 a head), a decent local spot with a lovely vine-covered terrace, though if you can afford to splash out you’ll eat better at atmospheric Locanda Don Serafino (via Orfanotrofio 39; 932 248 778; locandadonserafino.it; average £55 a head). Stay at L’Orto sul Tetto (Via Tenente Distefano 56; 932 247 785; lortosultetto.it; doubles from £59), a charming three-room b & b in a Pompeii-red town house; breakfast is served in the roof garden. On the same latitude as Tunis, Scicli is a town where operatic historic set-pieces and brutish modernity coexist, not least in the main piazza, where a Sixties school building muscles in on a gracious succession of Baroque palazzos. Less touristy than Ragusa Ibla, Scicli radiates that mix of bella-figura theatricality and anarchic individualism that animate the Montalbano books and their small-screen adaptations. Key Montalbano locations are the Palazzo di Città town hall, which stands in for the Vigata commissariato (police station) in most of the main series, Palazzo Iacono in Piazza Italia, which becomes the regional police HQ in Montelusa, and handsome Via Mormino Penna with its polished flagstones and neat sandstone townhouses. It’s worth climbing up to the hilltop church of San Matteo, permanently “in restauro” but with sweeping views across the town centre. Eat at La Grotta (Via Santa Maria la Nova; 39 0932 931 363: lagrottascicli.it, average £21 a head), a trattoria-pizzeria housed in a cave, which deserves to be in a Montalbano episode – not just for the setting, but because their cavatelli alla Norma (with aubergines, tomatoes and salted ricotta) are a perfect, textbook version of one of the commissario’s favourite pasta dishes. Scored by seasonal torrents, the ancient rural landscape of gnarled olives and drystone walls between Ragusa and the sea is a recurring locus in Montalbano’s world. Here you’ll find a former Knights of Malta fiefdom, the Eremo della Giubilliana (eremodellagiubiliana.it), which is now a boutique hotel – and features in the Inspector Montalbano episode The Shape of Water. Not far away, the late 19th century feudal castle of Donnfugata was mafia boss Balduccio’s sumptuous country pad in the Excursion to Tindari episode. The inspector’s seaside house – which he moves into in the second episode of Young Montalbano – has become a place of pilgrimage for Montalbano fans. It’s at Punta Secca, one of a string of pleasant seaside resorts south-east of Scoglitti. You can even stay here: bowing perhaps to the inevitable, the owners have turned the beachside villa into the friendly but fairly basic b & b Casa di Montalbano (Via Aldo Moro 44; 932 915 376; lacasadimontalbano.com, doubles from £77). Further east, beyond Sampieri, Monoresort Beach Club (Contrada Maganuco, Marina di Modica; 338 729 1550; monoresort.com) is the sort of place young Montalbano might have hung out if he was still young today: he’d approve of the fact that, for all the chic seaside beach-bar vibe, they take their seafood cuisine seriously here. Under the same Monoresort ownership are three design-sharp apartments in Modica’s centro storico (from £154), with two more due to be added later in 2013.